A real surprise on disc two is a dynamite reading of Robert Johnson's "32-20 Blues" that was originally recorded for the covers-only World Gone Wrong, but left in the can. 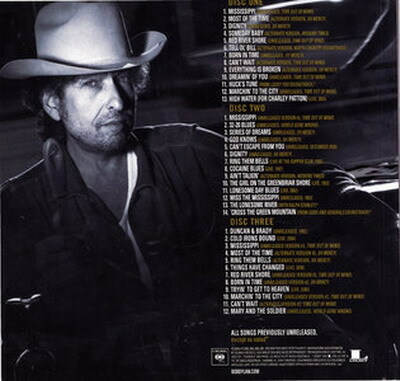 A completely unreleased tune, "Can't Escape from You" portrays Dylan the folksinger as a lover of early rock & roll ballads. In his own wrecked way, he pays homage (in waltz time) to the Platters, Doc Pomus, Leiber & Stoller, and Cisco Houston with a lonely B-3 and trebly guitars. There are two takes of "Dignity" here as well (one on each disc), the first a prophetic gospel solo piano version and the second a full-band roots rock rave-up. The version of "Ring Them Bells" recorded live at New York's Supper Club is so utterly moving that it raises goosebumps and leaves the studio version in the dust. The disc closes with the greatest moment on the whole set: "'Cross the Green Mountain," from the Gods and Generals soundtrack. Veteran Dylanologist Larry Sloman claims in his truly brilliant and incisive liner notes that this "might be his finest hour as a songwriter." The amazing thing* It's not just hyperbole. 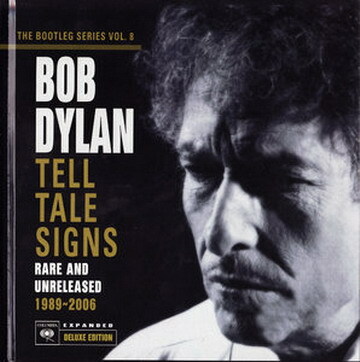 In all, even in some of its familiarities, Tell Tale Signs feels like a new Bob Dylan record, not only for the astonishing freshness of the material, but also for the incredible sound quality and organic feeling of everything here. It's a carefully presented set, but it's full of life and crackling energy and offers yet more proof -- as if any were needed -- that Dylan remains as cagey, unpredictable, and yes, profound and relevant as he ever was.